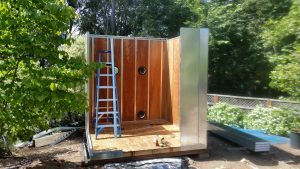 After Maker Faire I decided to setup the 8×8 building in our backyard. Since it will be there for a while I did a permanent setup, bolting everything together through the pre-punched holes instead of using the tie down straps. It took just under three hours for me to setup by myself (there wasn’t any wind). I used partly buried concrete piers and leveled the 4x4s on them. Then I placed the floor panels on the 4x4s. 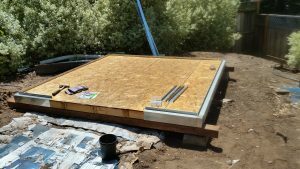 Then the wall base flashing was screwed to the floor panels. 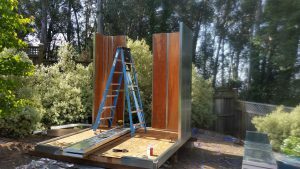 Next I assembled the walls. As each wall was completed the u channel top cap was installed. Then the roof is set in place. It is held on with Dual Lock – sort of an industrial strength Velcro. 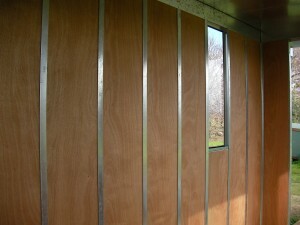 Once the roof was on, the walls were bolted down and the doors went on. Finally, the windows, vents, and side wall top covers were installed. I started assembling the building at about 9am Saturday morning. By noon it was complete and it was time to relax. 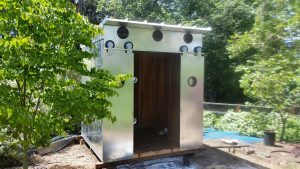 I haven’t worked on my steel panel building system in several years. 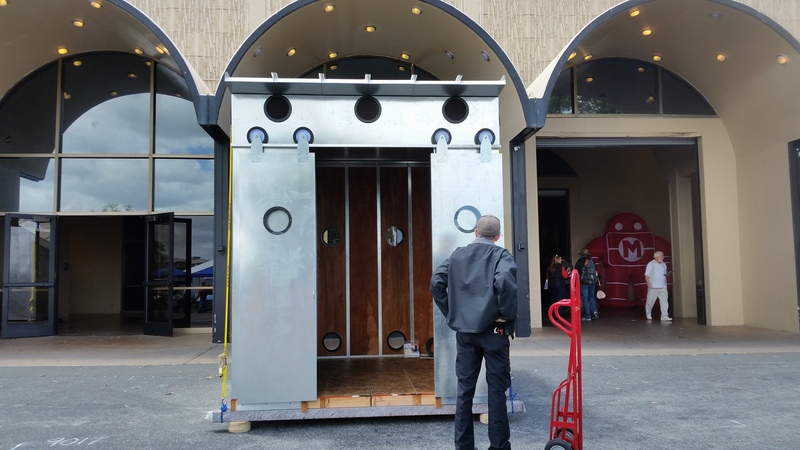 Recently I decided to make some improvements I’ve been thinking about, and the Maker Faire in San Mateo was the motivation I needed. 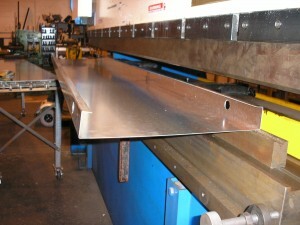 So about three weeks ago I started fabricating parts for the new building. 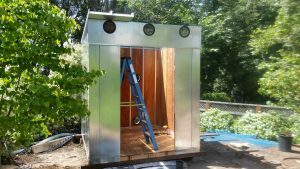 I’ve made some significant changes and the building can now be assembled in one hour without any tools, and disassembled in 40 minutes. It did take five people to assemble it due to high winds, and three people to disassemble. 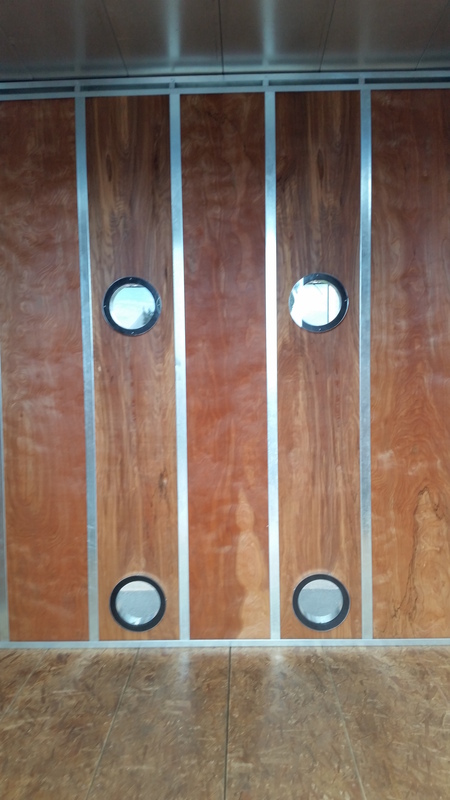 Porthole windows and vents simplify assembly and improve security. Barn doors are easy to attach. 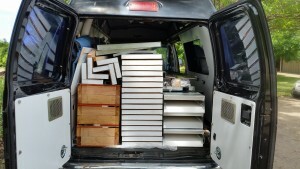 Cargo straps hold everything together for temporary installations. 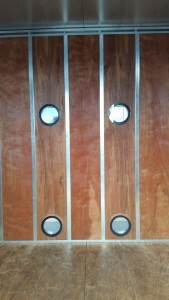 There are pre-punched holes for screws for a cleaner look on more permanent installs. 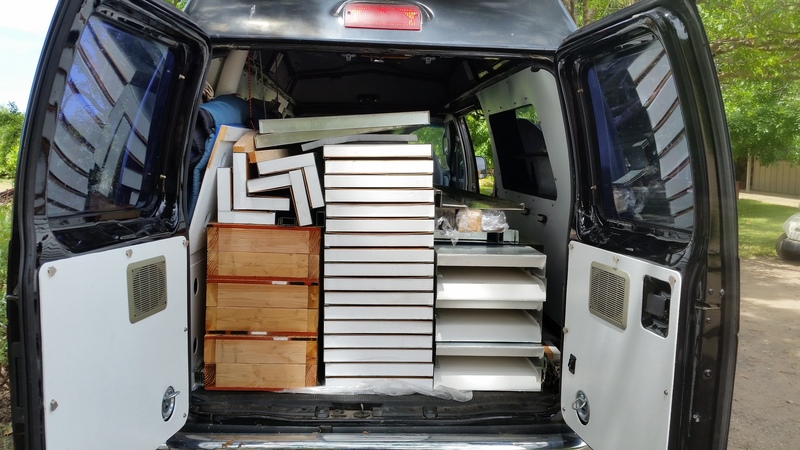 Everything for an 8′ x 8′ building fits in a cargo van. 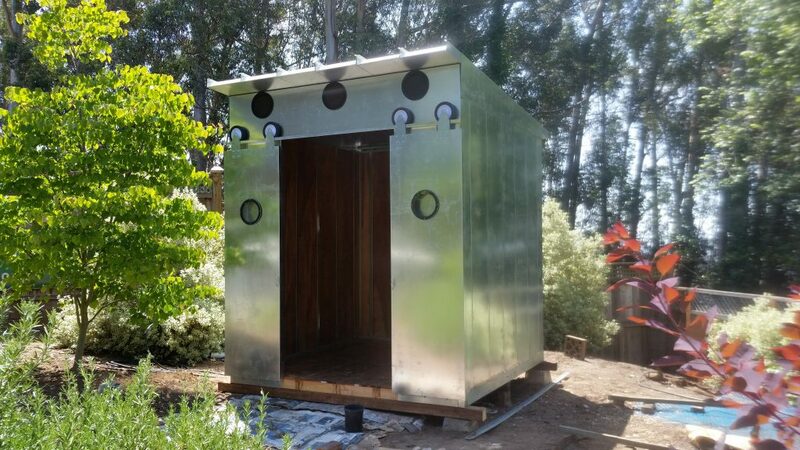 Cost for this 64 square foot building is $8000 when hand built one at a time, or $125 per square foot. 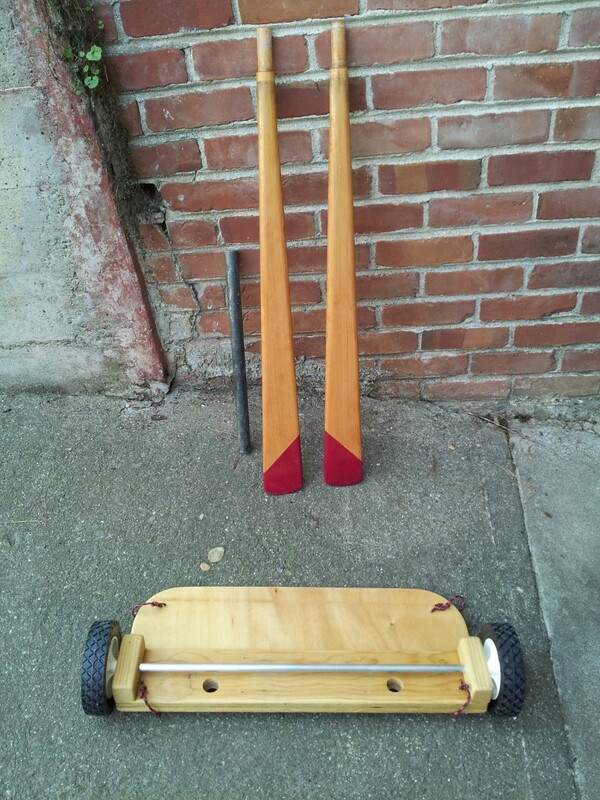 I have built a few paddles and a very versatile kayak cart over the past couple of years. 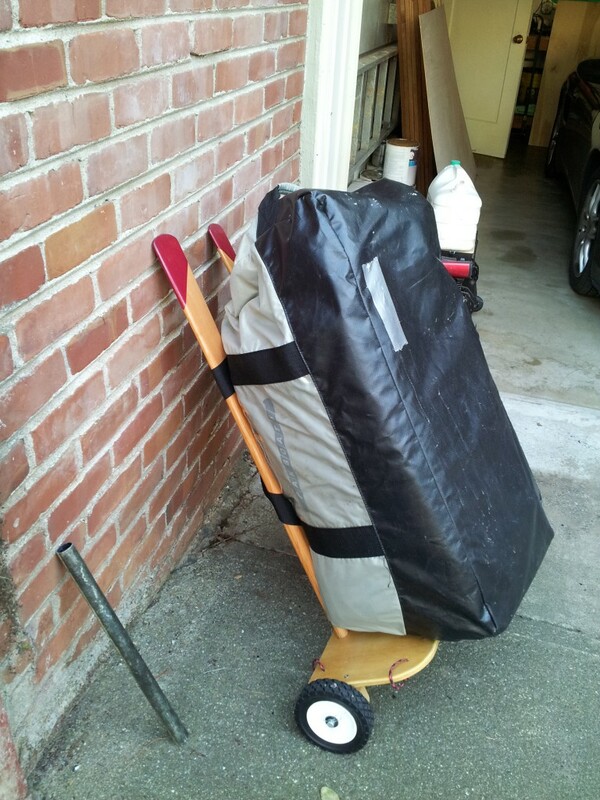 I have a folding kayak that is great for traveling, but it weighs close to 50 pounds. With my other kayaking gear and luggage I have about 100 pounds to carry. I wanted something that could be used as a luggage cart and a kayak cart, and was lightweight and compact. I searched for quite a while without finding anything, so I decided to build my own. What I came up with is the cart shown above. 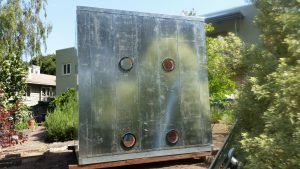 It is a piece of plywood with wooden pillow blocks on the bottom for a 1/2″ aluminum axle. The axle accepts either the 6″ wheels shown, or larger 12″ wheels. 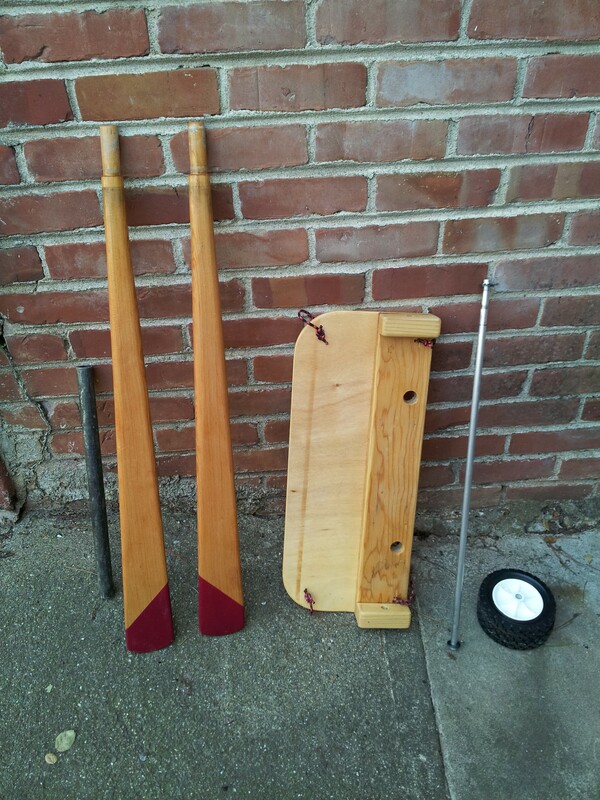 There are two 1″ holes at the back of the cart that the blades from my three piece Greenland paddle fit into when I use the cart for luggage. The loops of line on the four corners of the cart are used to strap baggage or the kayak to the cart, and to attach the cart to the deck of the kayak. 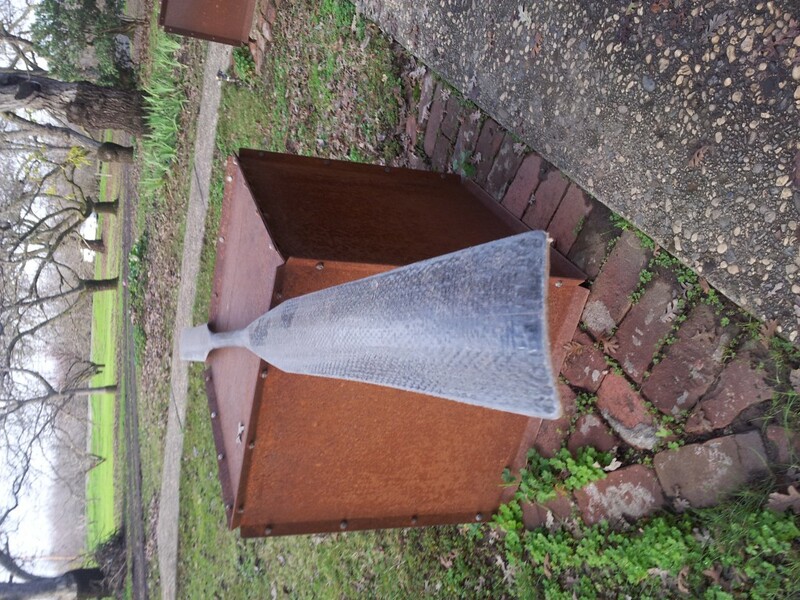 I have also added a fitting to the bottom of the cart for the mast of my kayak sail. This way the cart can be used as a mast base when it is on the deck of the kayak. 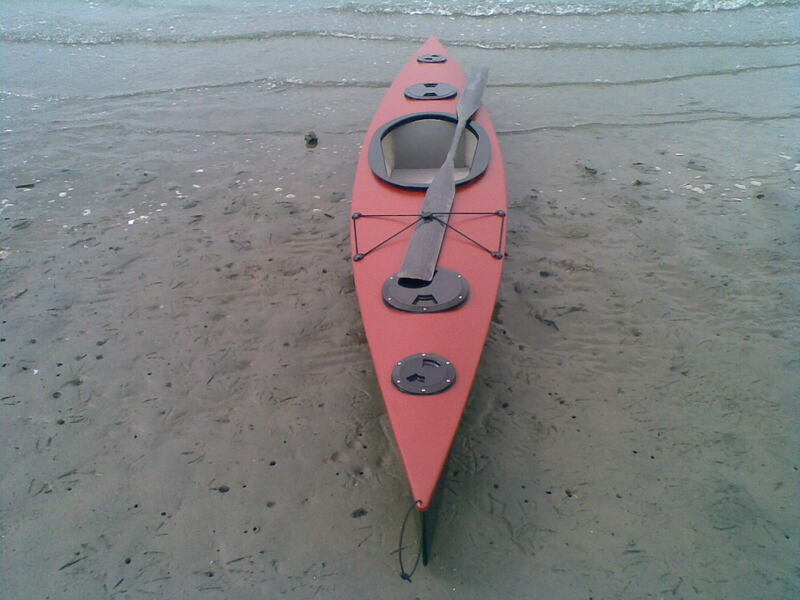 I may also add attachments so my spare paddle can be used as a crossbeam for small outriggers. I used the cart on a recent trip on the Mississippi River and it really came in handy. 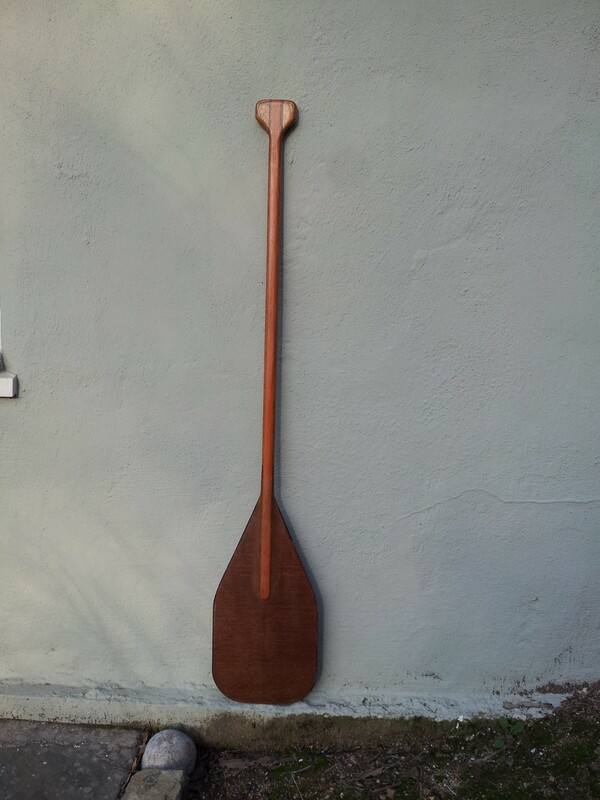 The Greenland paddle I made as part of the cart has ended up being one of my favorite paddles. The blades are made from straight grained fir and encapsulated in epoxy. The shaft was made by wrapping two layers of unidirectional carbon fiber, one layer of biaxial carbon fiber, and one layer of fiberglass around a 1″ aluminum tube that had four wraps of wax paper around it. The cloth was soaked in epoxy, and everything was tightly wrapped in peelply. After it cured I slid the shaft off of the aluminum tube, cut it to length, and clear coated it. It weighs about 30 ounces. 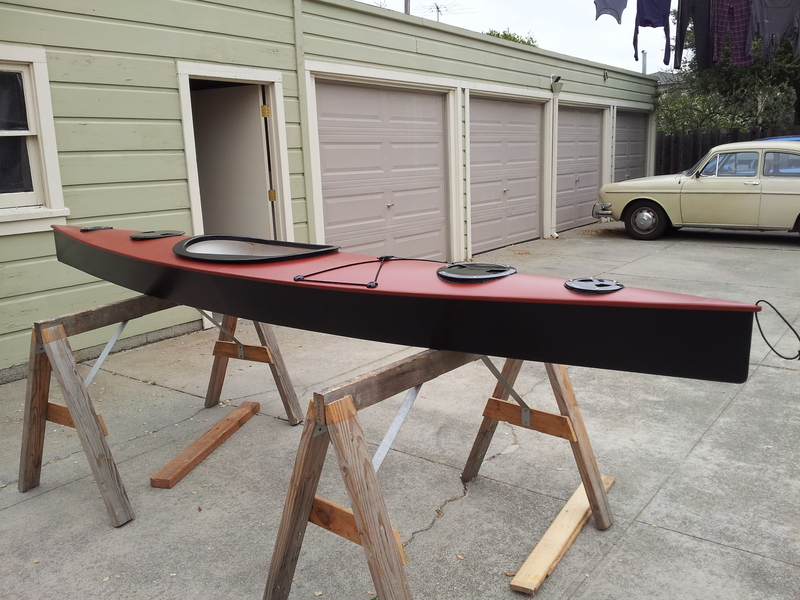 Previously I had built an experimental paddle out of carbon fiber and balsa that has been partially successful. 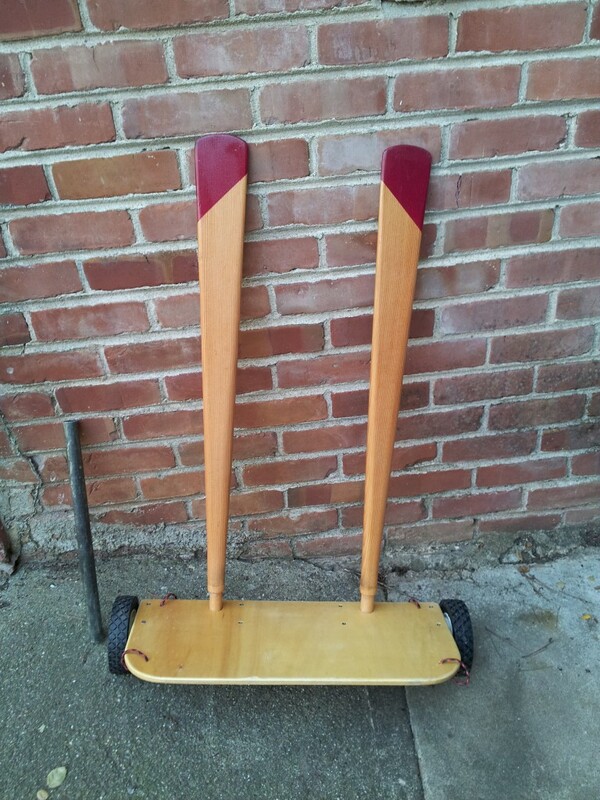 The blades of the paddle are very thin but were formed over an 8″ diameter tube to to give them strength. 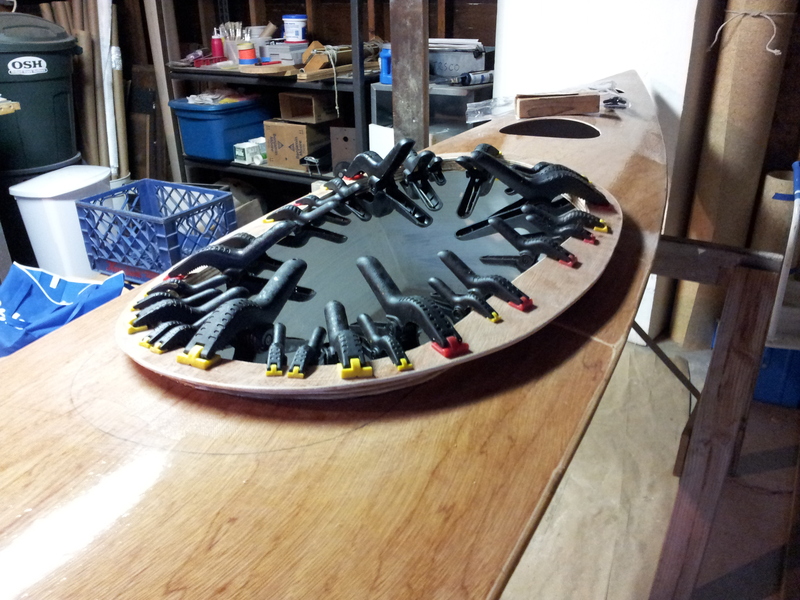 The paddle has a balsa core with unidirectional and biaxial carbon fiber skin. 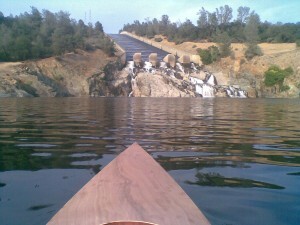 The paddle weighs 17 ounces and is quite strong – when paddling forward. 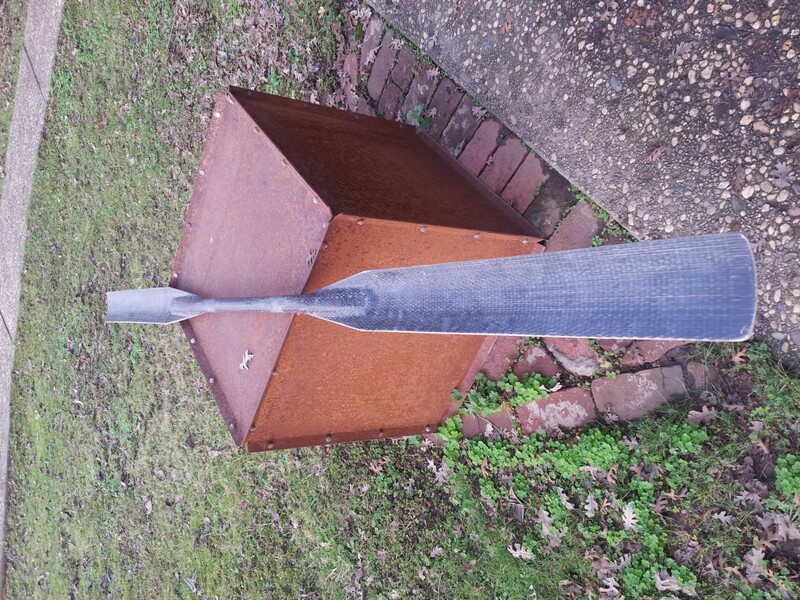 When back paddling the blades twist and if enough force is applied they will break. On a very windy day while paddling from San Francisco to Oakland I broke a blade while trying to keep from broaching while surfing waves in a heavy sea canoe. So the paddle is good for fast paddling on smooth water, but not acceptable for rough water. 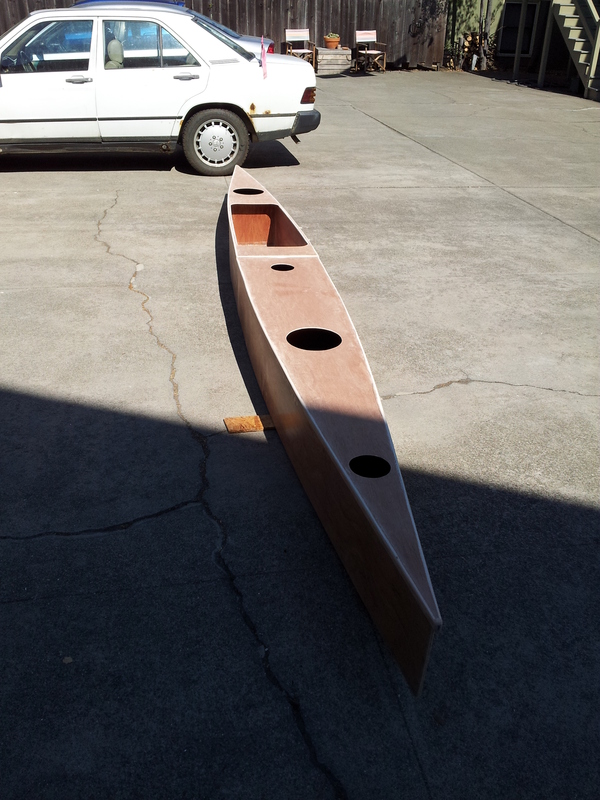 The other paddle I built is for outrigger canoes. I built it out of wood scraps. 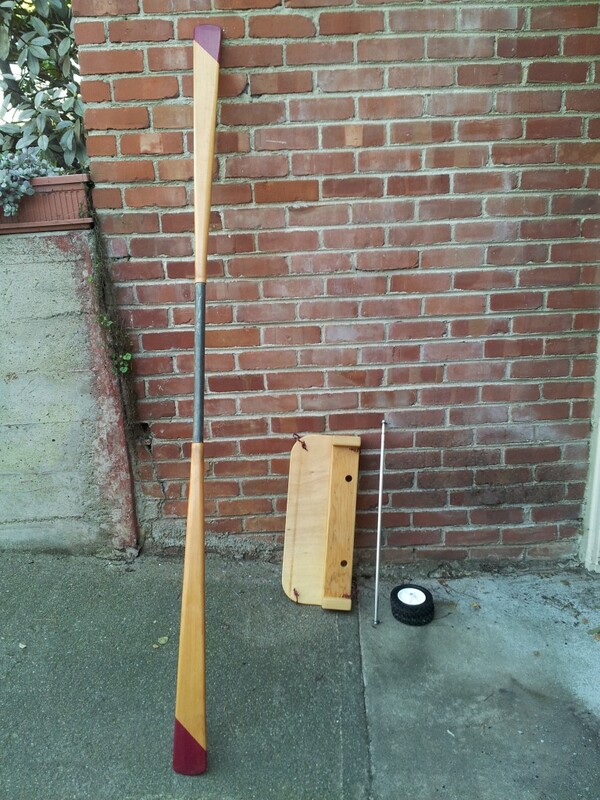 It is heavy and strong, and works well with outrigger canoes that are sailed and only occasionally paddled. The conversion of the canoe I built into an outrigger sailing canoe got me hooked on outriggers, so I had to design and build a better one. 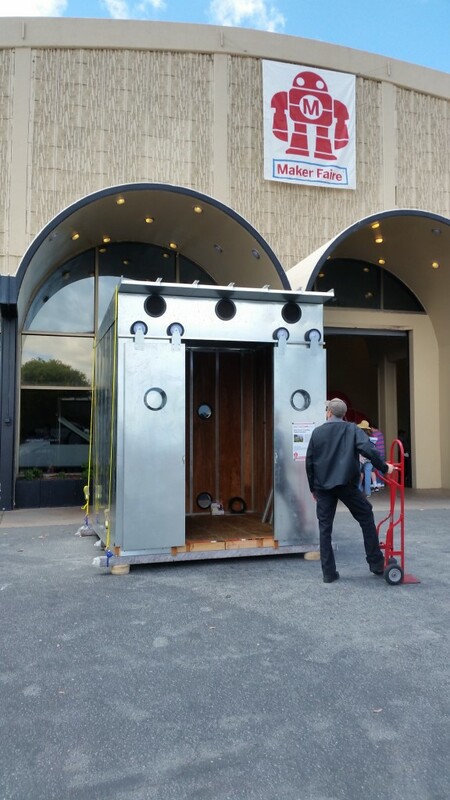 The Model B has a 16′ long by 16″ wide main hull that breaks apart into two 8′ pieces for easier storage. 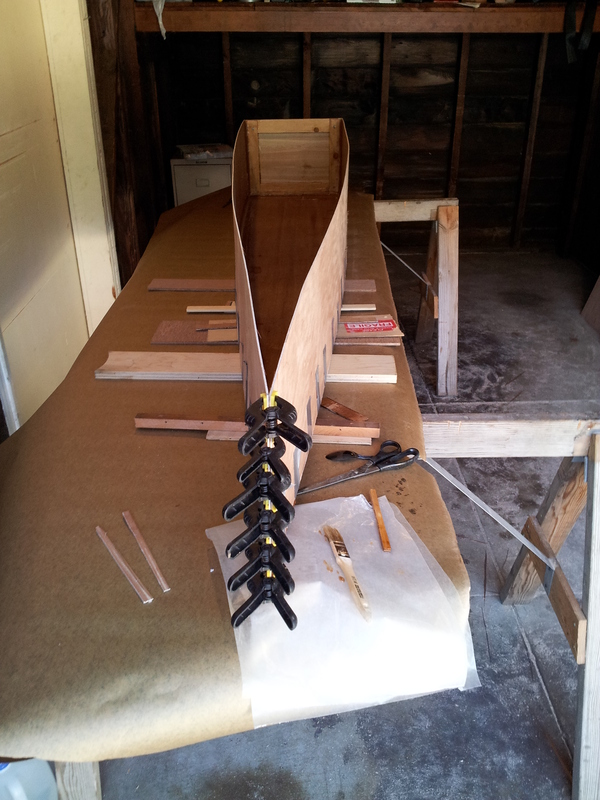 The construction method of the main hull is the same as for the kayak in the previous post. Cutting out the hull panels. 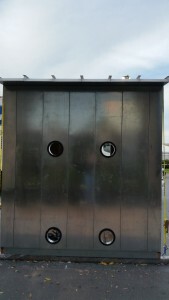 The hull is once again symmetrical front to back so there are two identical bottom panels and four identical side panels. Tape and glue (and clamp) construction. 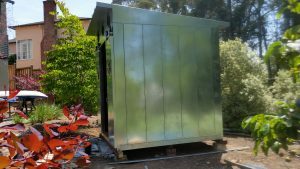 The panels are temporarily taped together with duct tape then glued together with thickened epoxy covered by a strip of fiberglass tape. Next the inside of the hull is coated with epoxy and the floor of the cockpit is reinforced with a layer of fiberglass. 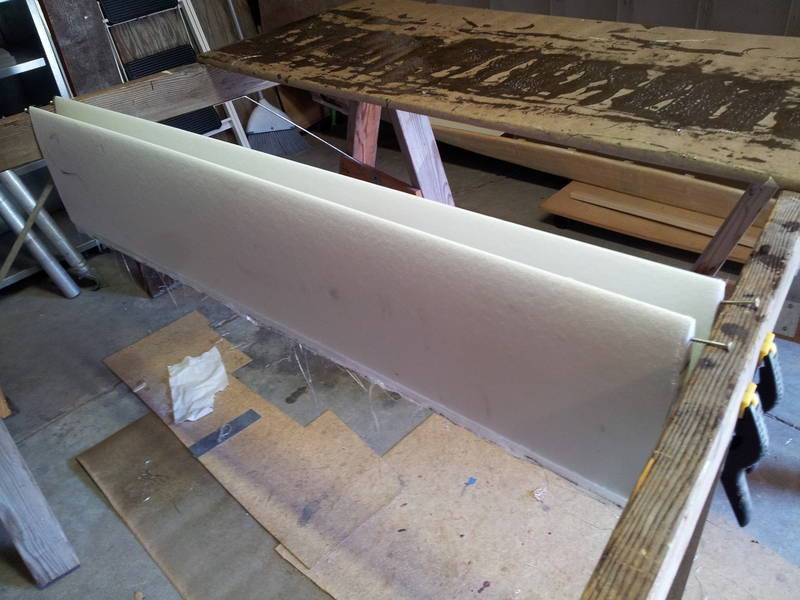 The exterior of the hull is fiberglassed. The hull is flipped over and fiberglassed. Deck in place and fiberglassed, with cutouts. 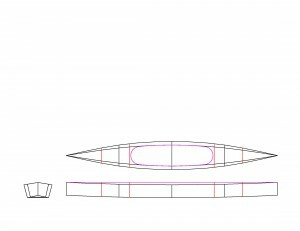 The deck is attached and fiberglassed, and the cockpit and hatches are cut out. The floats are made from foam encapsulated in fiberglass. I may have mentioned in earlier posts that I don’t like sanding. So I sent an AutoCAD file of the floats to a foam fabricator and for $40 they CNC wire cut the foam for both 6″ x 6″ x 12′ floats. 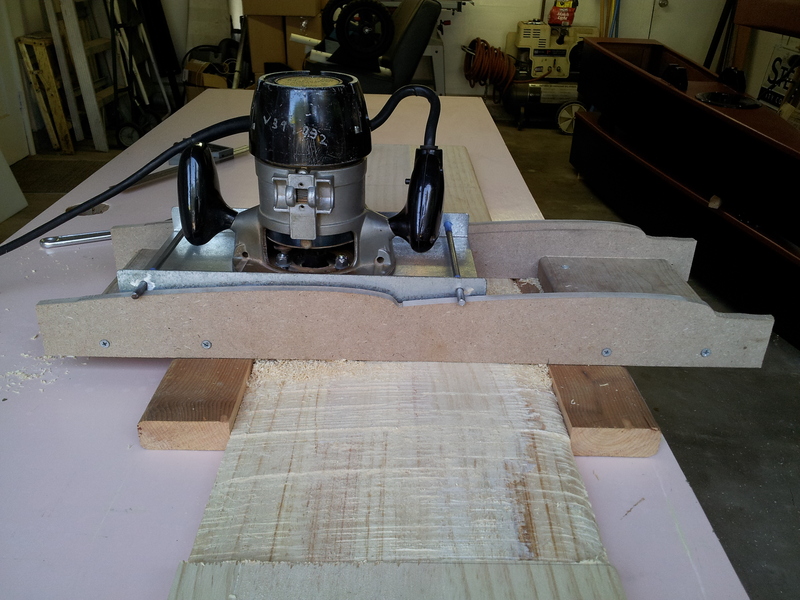 I made a router fixture to cut the leeboard and rudder. Fixture for routing the foils. After an hour of cutting with my old underpowered router I decided to send an AutoCAD file of the foils to my foam guy. For $20 he CNC cut blanks for me. 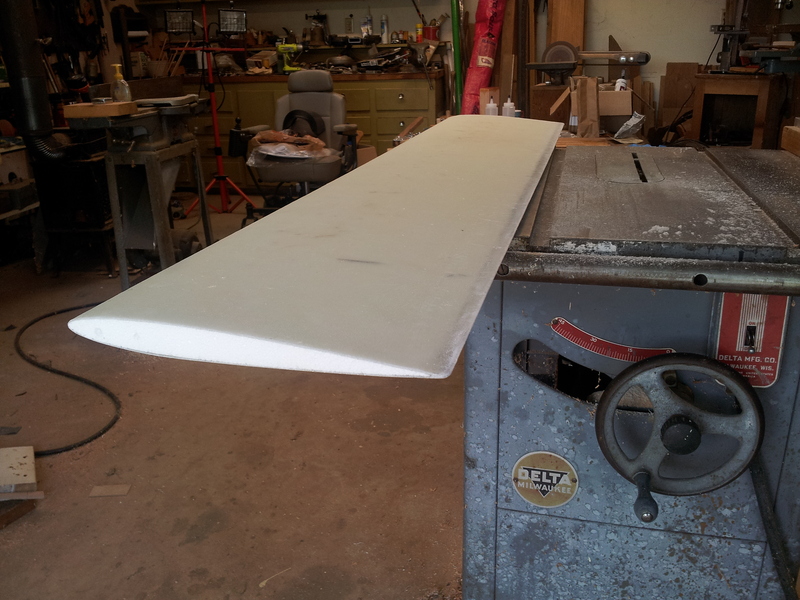 The foam blanks are covered with four layers of fiberglass and peelply (no sanding). I peel the peelply off the foils and trim the excess fiberglass from the trailing edges on the tablesaw and the foils are perfectly shaped. I am going to remove the foam from the center and pour epoxy with filler into the foils to add strength, but haven’t yet. 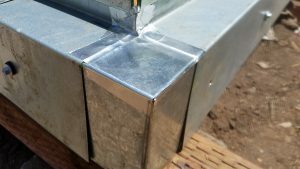 The foils go into cassettes made from aluminum and nylon that clamp to the crossbeams. 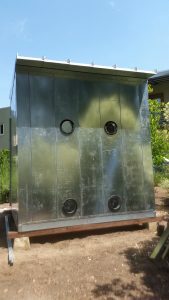 The depth of the foils can be adjusted by raising and lowering them in the cassettes, and the cassettes rotate on the crossbeams so they kick-up if they hit something. Since I sail in the San Francisco Bay and there aren’t many beaches, the crossbeams fold on the starboard side to make it easier to access docks. It takes about an hour to assemble the boat. The two halves of the hull are bolted together, The crossbeams are lashed to the main hull, and the floats are lashed to the crossbeams. The foils are attached, the sail is rigged, and the boat is ready to sail. 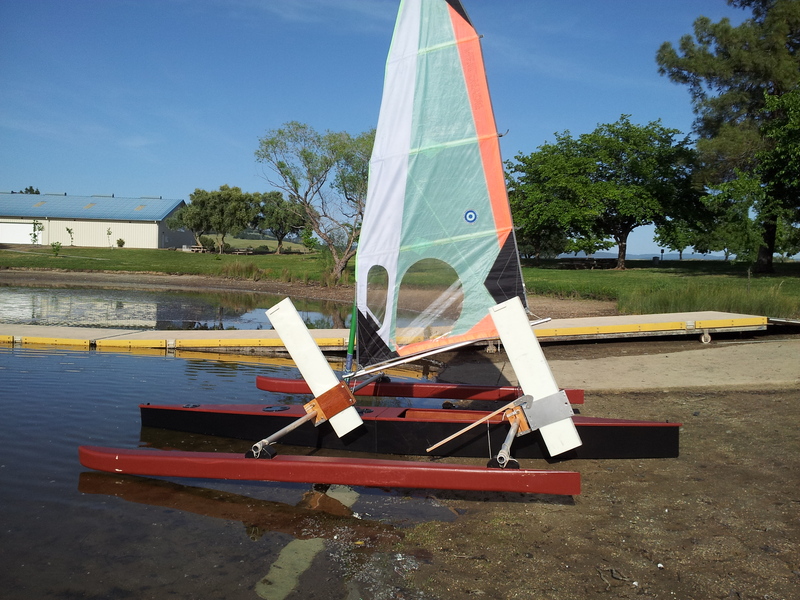 This boat is pretty fast when the wind picks up, and pretty wet – the leeboard kicks up a rooster tail. Tacking is better than in Model A, but I still have to paddle through sometimes. A better sail and moving the rudder to the stern should improve things. The biggest problem is the hull is narrow so there isn’t much room. 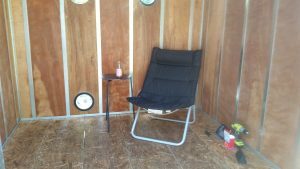 I built a hiking seat but I still end up standing on the sheet or sitting on the tiller. Model C will be longer. 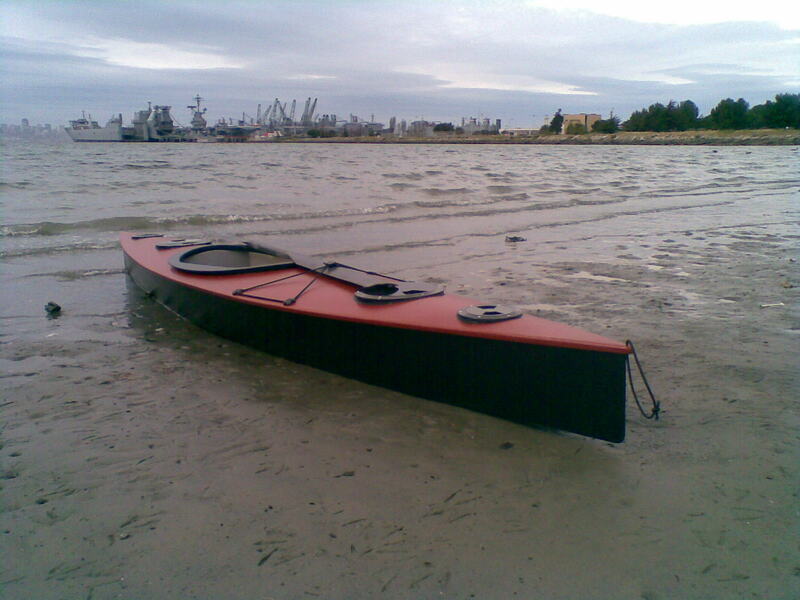 Ultralight kayak on the beach at Alameda. My first kayak was a heavy rotomolded sit on top. I had a lot of fun with it, but it was heavy and slow. The decked canoe/outrigger sailing canoe I built is lighter and faster, but it is too long to haul around all the time and has a large cockpit that isn’t good for rough water. 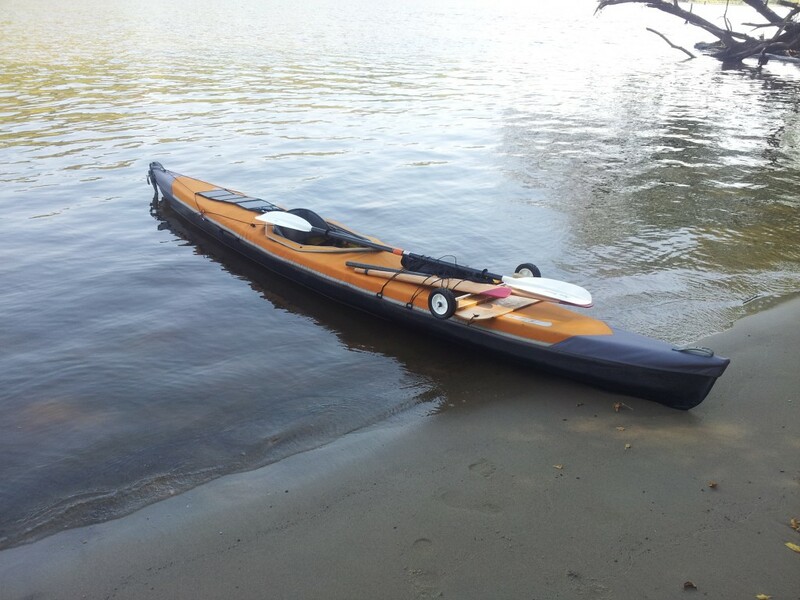 So I built this lightweight kayak for everyday use. 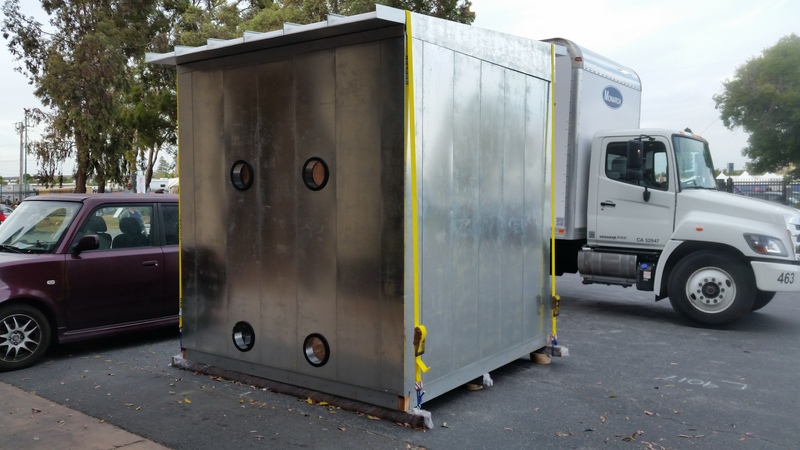 It is 12′ long, 22″ wide, and weighs 24 lbs. 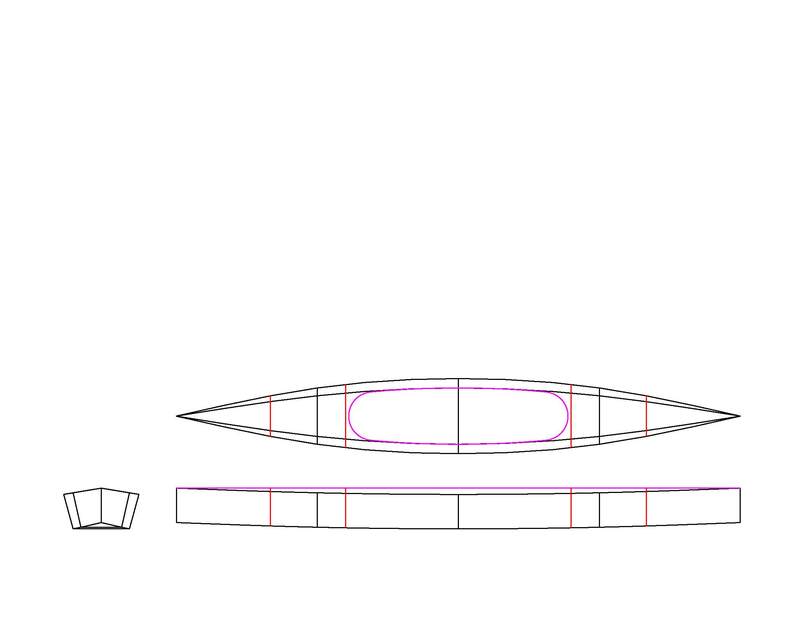 I designed the kayak using Hulls and AutoCAD. I printed out full sized patterns and traced them onto the panels. the kayak is symmetrical front to back so I cut out four identical half side panels at one time, and two identical half bottom panels and joined them together at the center. I used that crappy 1/8″ plywood from Home Depot again. The hull is assembled using duct tape to temporarily hold it together. 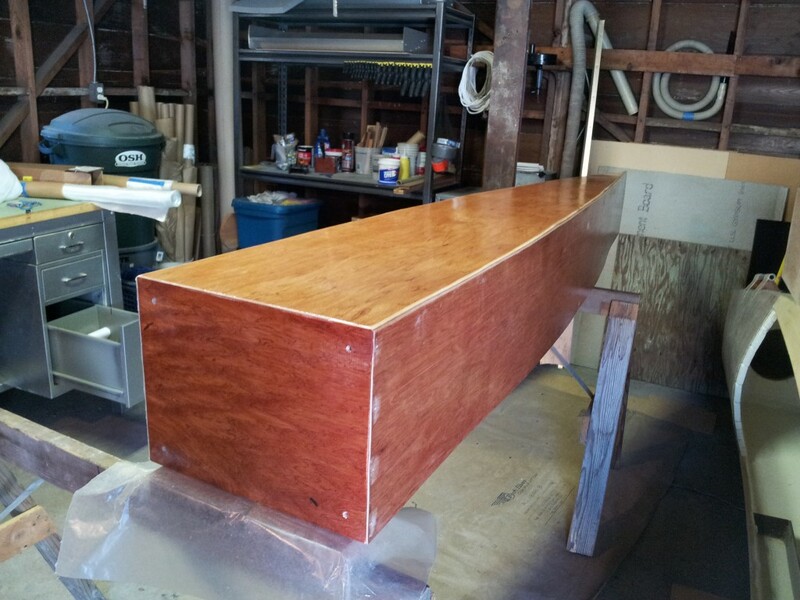 Once the side panels and bottom panel were epoxied together, the hull was ready to assemble. I temporarily taped everything together with duct tape, then filleted all the joints with thickened epoxy and covered the fillet with a strip of fiberglass. The assembled hull after the tape has been removed. 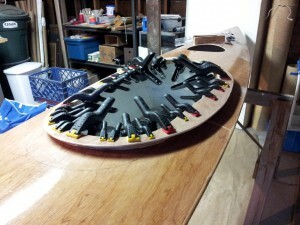 Before the epoxy was set, the bulkheads were tacked in place and alignment was checked. Everything was allowed to cure overnight, and the next day the bulkheads were filleted and taped in place and the bulkheads and inside of the hull was sealed with epoxy. I also fiberglass the floor of the cockpit and a few inches up the sides to add strength in this area. Fiberglassing the exterior of the hull. Once the inside of the hull was sealed, the kayak was turned over and the exterior of the hull was fiberglassed. 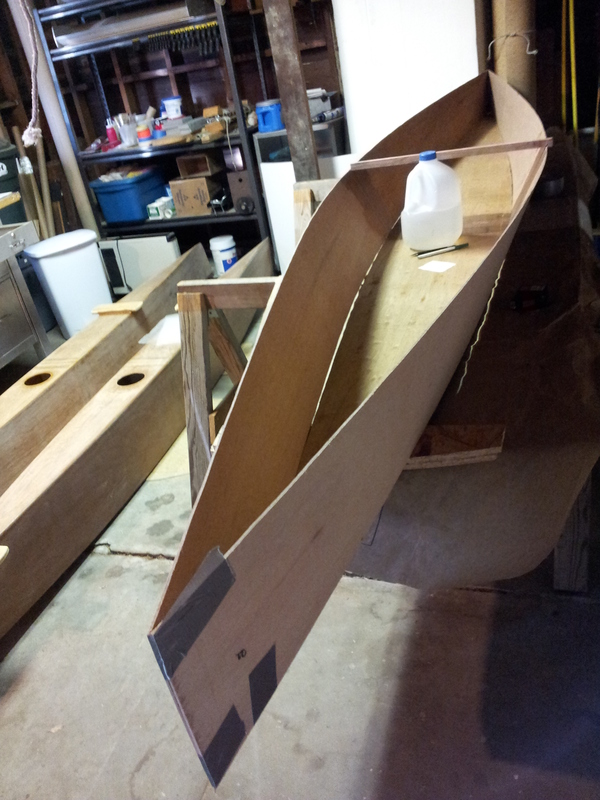 I ran the fiberglass past the ends of the bow and stern, then trimmed it even with the plywood once the epoxy gelled. 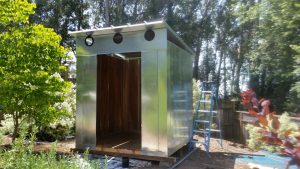 The next day I sanded the ends, then wrapped two strips of fiberglass over each end, covered with waxed paper, and clamped boards over the waxed paper. 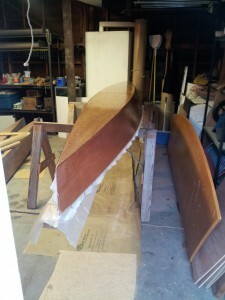 No more sanding on the bow and stern were needed – I hate sanding. 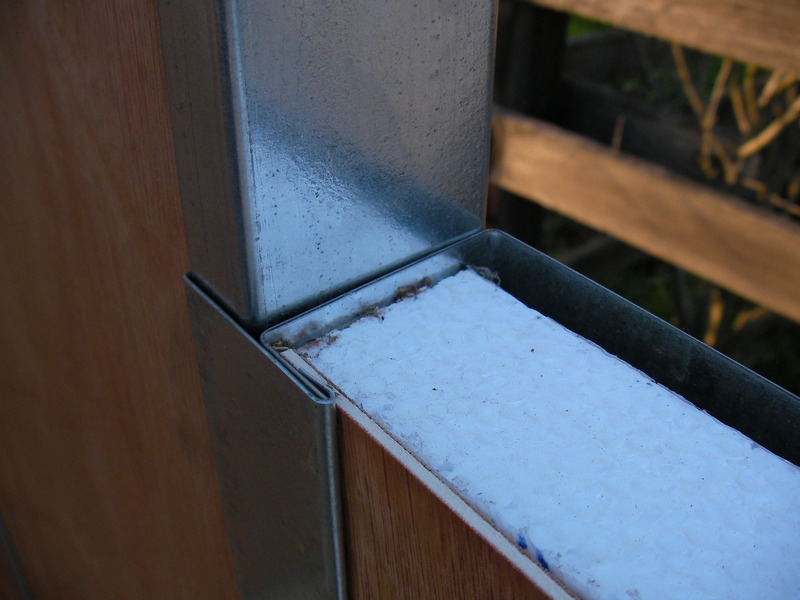 Installing the external sheer clamp. Next the external sheer clamp was installed with thickened epoxy. I used an external sheer clamp so the fiberglass on the deck could run over the sheer clamp and be trimmed even with its bottom edge. This way there was very little sanding required, and I hate sanding. Next, the deck was attached. 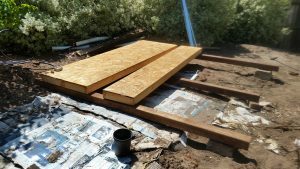 Since there wasn’t a deck beam the deck was not cut to shape – it was left rectangular so there would be a constant curve along the length of the deck. 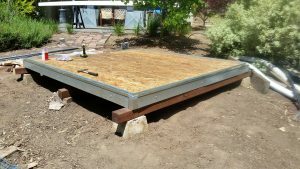 The deck would tend to have flat spots at the ends if this wasn’t done. The milk jugs full of water tied across the ends also helped to maintain the curve. 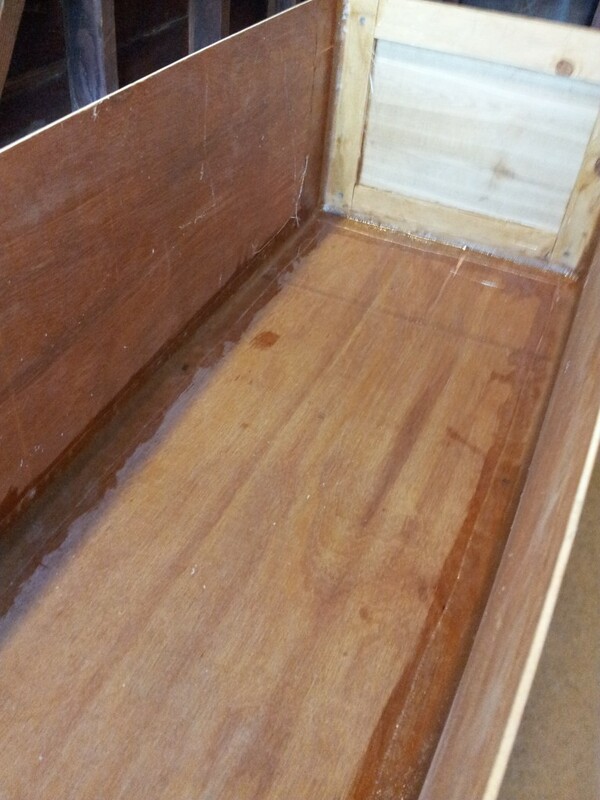 The underside of the deck was sealed with epoxy, and it was bonded to the hull with thickened epoxy. It was temporarily tacked in place while the epoxy set. The deck is trimmed even with the sheer clamps. 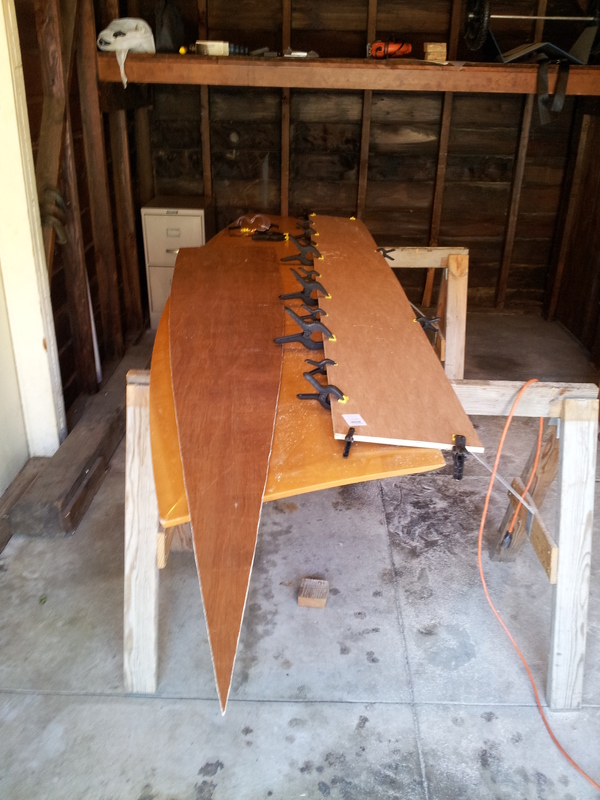 After the epoxy cured the kayak was turned over and the deck was trimmed even with the sheer clamps with a hand saw. 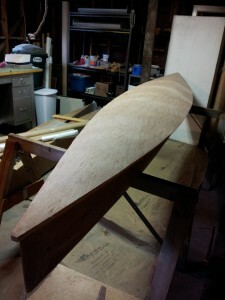 Then the kayak was turned right side up and the edge of the deck was rounded with a plane and rough sandpaper. 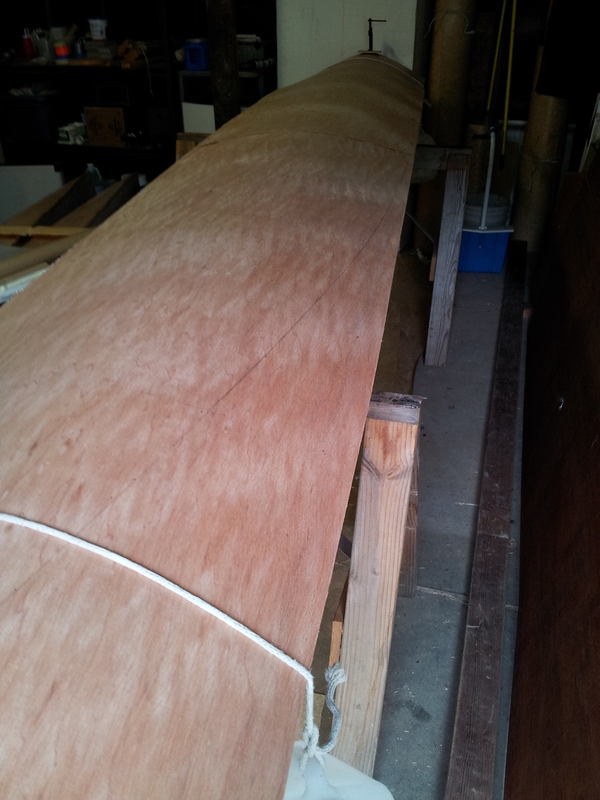 The deck was fiberglassed. Next the hatches and cockpit were cut out and the cockpit coaming was installed. The kayak was painted. The hatchcovers and deck lines were attached and kayak was ready to paddle. Not long after my last post over three years ago, a family member had some serious health issues. My priorities changed and I quit updating this blog. Now I have time continue with it (I hope). I have continued to work on some projects as time has allowed. 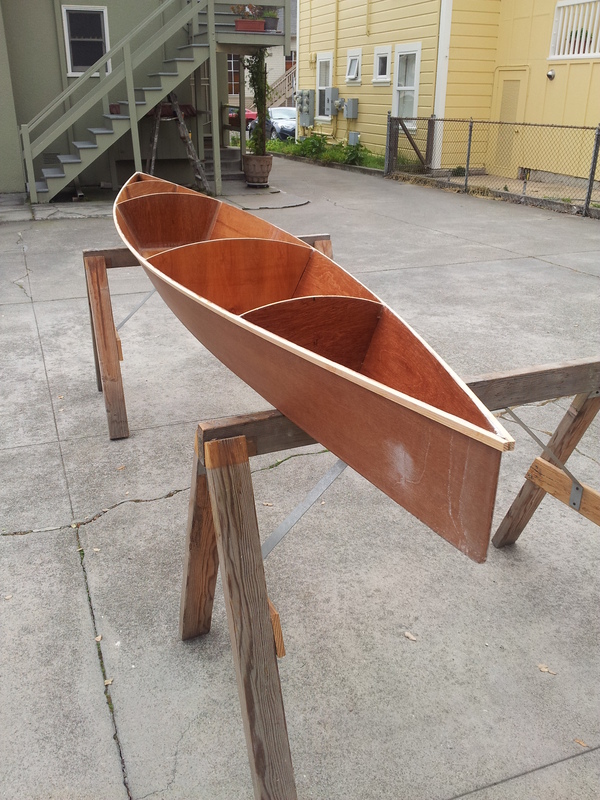 I’ve continued using the canoe I built three years ago. It’s a good canoe – stable, tracks well, and easy to paddle. I paddled it from the aquatic center in Oakland across the Bay to AT&T Park in San Francisco and back two years ago. It performed well, although I had a wild ride on the way back with 25 kph winds and steep wind waves. I broke a paddle but made it – I was relieved to get back to the calm water in the estuary. 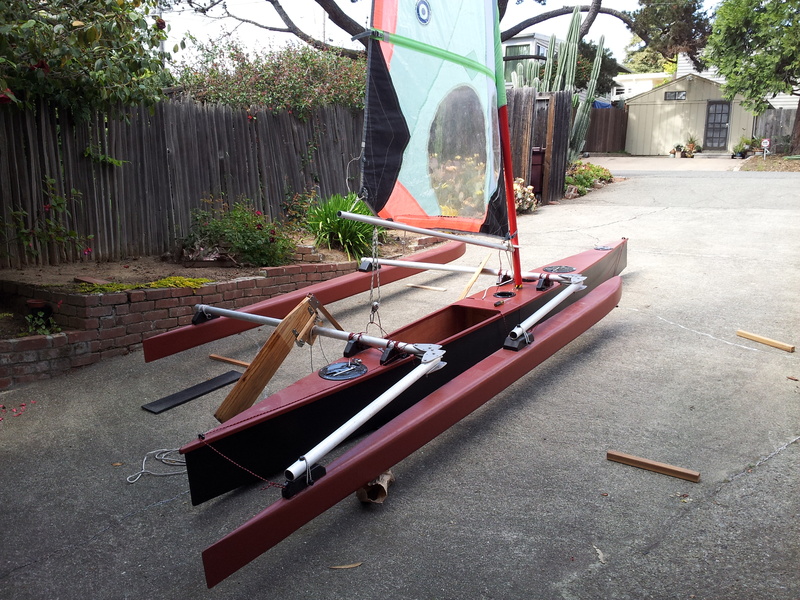 Not long after that I became interested in outrigger sailing canoes and decided to put outriggers and a sail on the canoe. I had some old 2″ aluminum tubing that I used for the crossbeams. I bought some 4″ PVC drain pipe at home depot and capped the ends with foam. 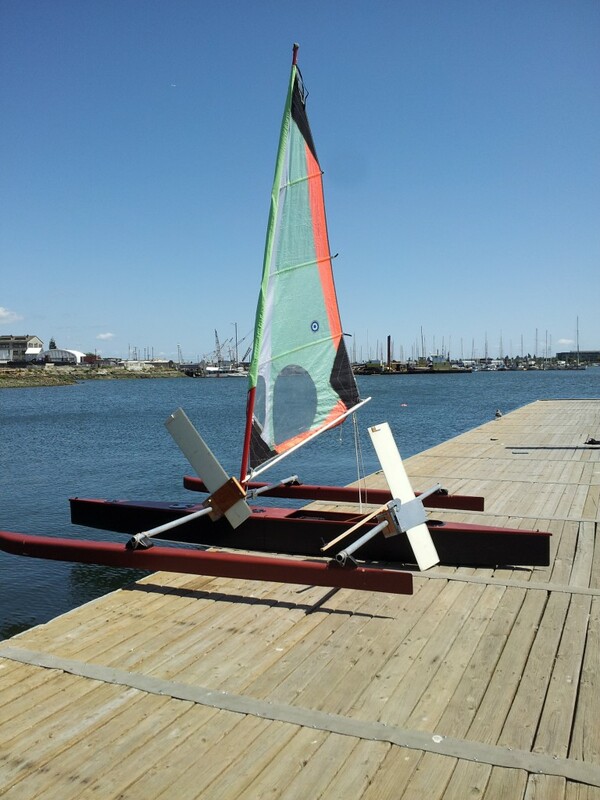 I shaped a leeboard and a rudder out of some 1″ fir, got my old windsurfing mast and sail out of the basement, lashed it all together, and went sailing. It’s not the best sailboat I’ve ever been on, but it works. It takes about an hour to unload everything and get it assembled. It doesn’t sail very close to the wind – maybe 70 degrees. I usually have to paddle to complete a turn. 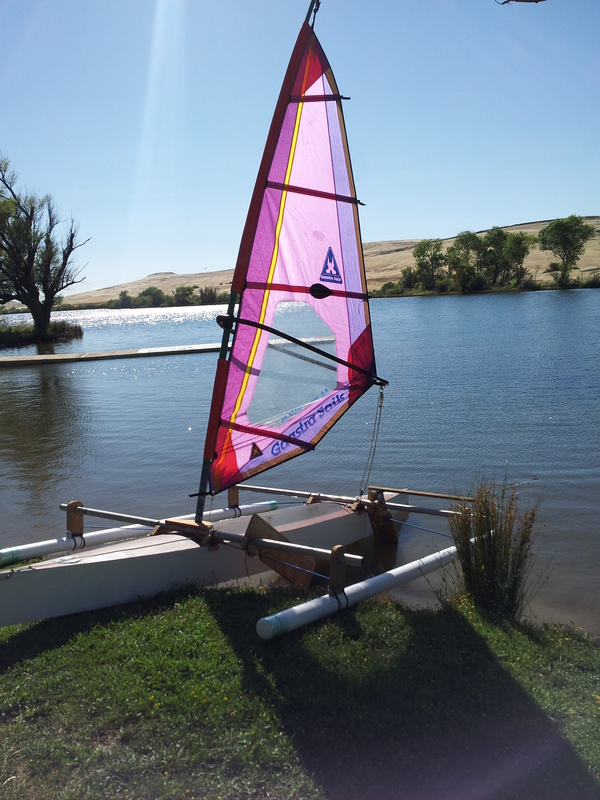 But it is a fun little boat and it got me more excited about outrigger sailing canoes. Even though it has many design flaws it’s a quick little boat. Unfortunately I completely lost interest in the sailing canoe I started four years ago – it was too slow, so I gave it away. Once one has experienced an outrigger sailing canoe it is hard to go back to slow boats. 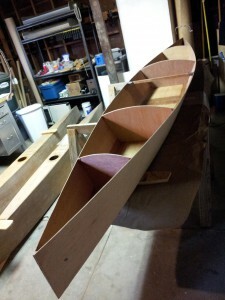 I’ve now had the chance to test the Huck Finn Canoe several times, and I was definitely wrong about the stability. The boat is very stable. In fact, when I tried to tip over to see if I could re-enter from the water, I had a hard time getting it to tip. 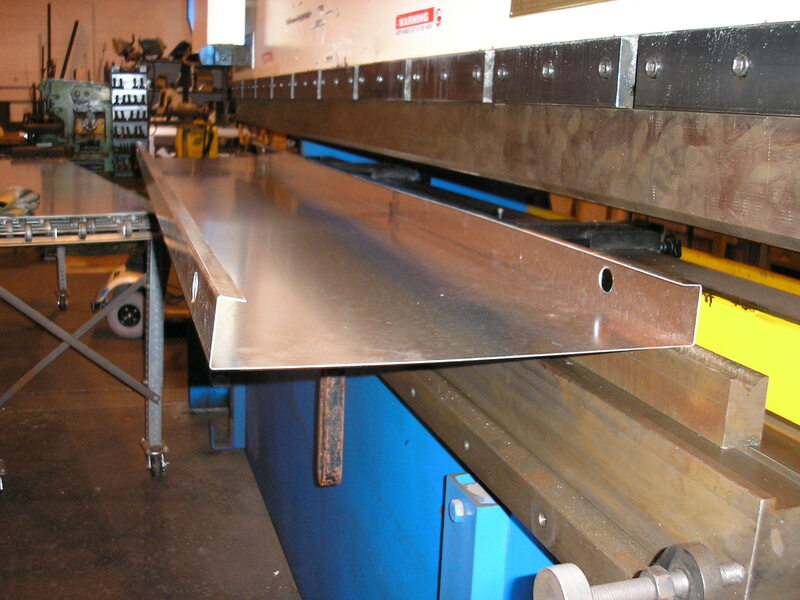 One has to roll to about 80 degrees before it goes over – I think this is because of the high, flat sides. I was also concerned about being able to get back in the boat after a wet exit, especially because of the deck height. This turned out not to be a problem either. The boat was practically dry inside when I turned it upright, and I was able to jump back in on the first try with no difficulty. I also checked the speed of the boat with my GPS. If I paddle pretty hard I can reach 4.6 kts. Paddling at a leisurely pace I can maintain 3.5 kts. This was in flat water with a light breeze. We haven’t had much wind lately so I do not know how the wind will affect performance. I’ve always wanted to do the Huck Finn thing and float down the Mississippi River. If I were smart I would fly to Minneapolis, buy a kayak, paddle to New Orleans, sell the kayak, and fly home. But let’s face it, I’m not that smart, so instead I ask myself what would Huck Finn do? Of course we know the answer – Huck would hang out on an island until a raft floated by, jump on, and be on his way. Since I live nowhere near the Mississippi River this will not work for me, and anyway it is doubtful that derelict rafts are still as plentiful on the Mississippi as they were in Huck’s day. 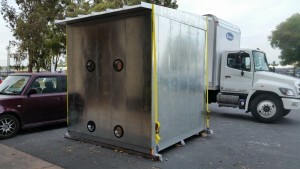 Here is a photo of the almost complete prototype. 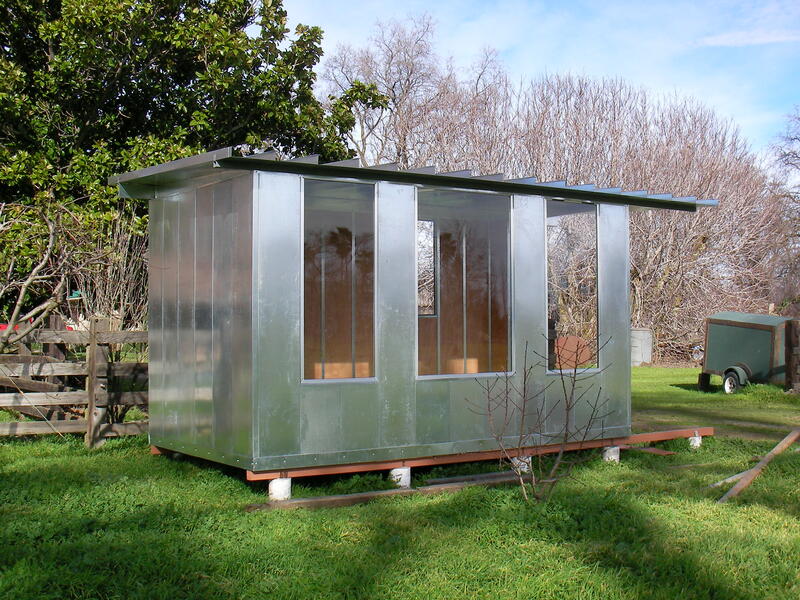 The building is 8′ x 15′. 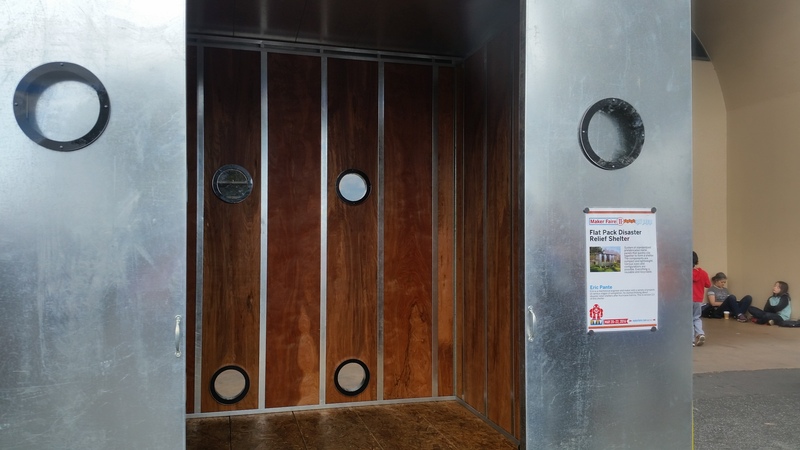 It has an 8′ ceiling. There are three large windows in front and two smaller windows in back. 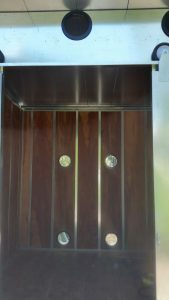 The exterior can be painted or left natural. My solution is to use two basic panels as the building blocks to assemble a building. 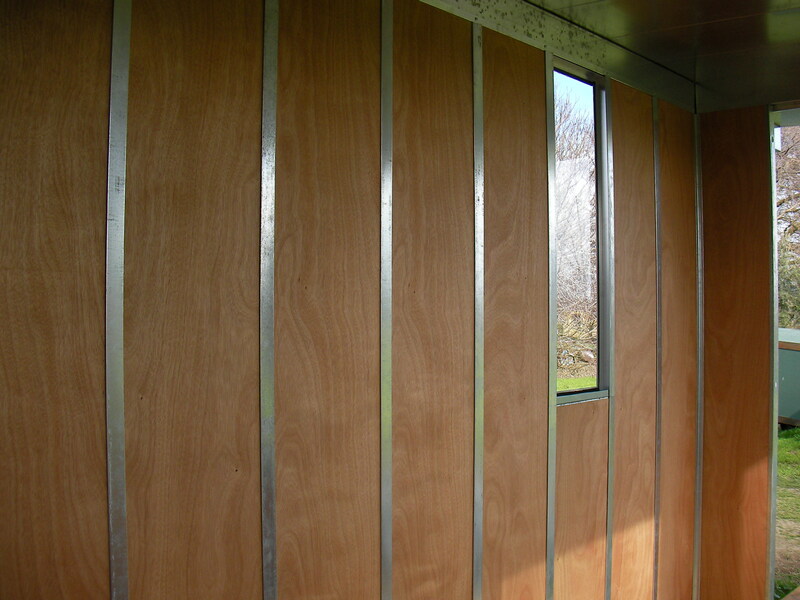 The wall panel is a 2″ thick ‘c’ shaped panel 8′ long. 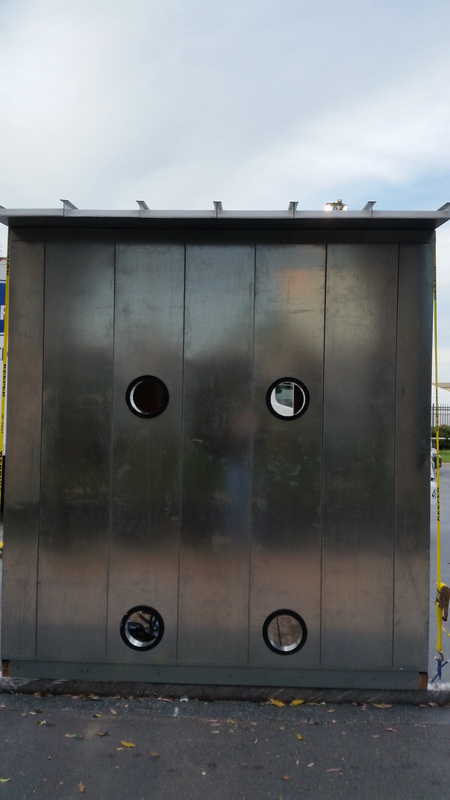 1″ holes are pre-punched in the flange near the top and bottom of the panel to run electrical wiring if desired.